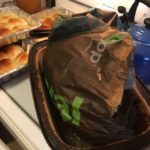 Paper Bag Turkey – perfectly done! When my husband announced he wasn’t up for our usual fried turkey this year, I panicked slightly. 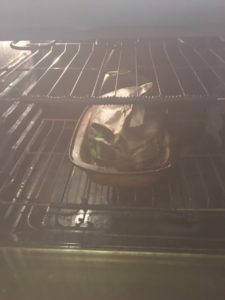 It’s been a few years since I actually cooked a turkey in the oven. I soon fell into and got tangled in the world wide web. 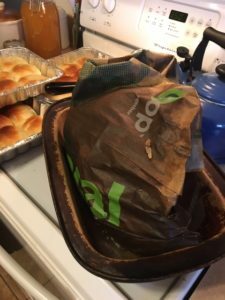 I don’t know I found the idea of cooking our turkey in a paper bag, but it suited me. The promise was a perfectly cooked turkey, juicy, brown, no basting. Yes, please. I looked at a few posts and then, as usual, set my own course. I could tell The Captain was skeptical, but in the end, everyone was deliciously pleased. 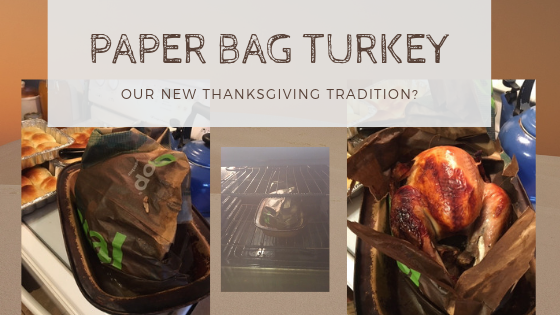 Pre Step 1: While the turkey was still in the original packaging, I placed it in a paper bag to make sure it would fit so that the entire bird would be enclosed by the paper bag. A bigger bird may need two bags stapled or sewn shut. Pre Step 2: Take out neck and innards. I make my gravy in advance, using the neck and supplementing the gravy with chicken broth if needed. 1. 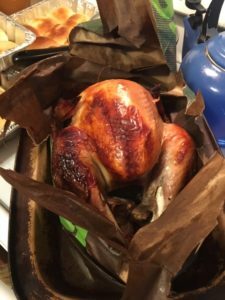 I brined my turkey for 24+ hours. 2. On Thanksgiving eve I brought the bucket of brine and turkey in to come up to room temperature overnight. 3. Thanksgiving morning (I needed three hours for my small 12 pounder to cook for our mid-day meal) I poured off the brine. 4. I took about 3 tablespoons of butter and coated the inside of the paper bag with it. 5. I then coated the turkey skin with butter. I put the little butter left in the cavity of the bird. You could also add an onion and some vegetables if you like. 7. I put the bird in the bag (and the entire package into a roasting pan) and stapled it shut after pouring about a cup of broth into the cavity. 8. I cooked the turkey for 3 hours at 375 degrees. No basting! 9. I removed the bird and let it sit for about 20 minutes. 10. I cut open the bag and we all stood around and gazed at the turkey. 11. We did need to peel the paper off the bottom of the bird when transferring it to the cutting board to carve up. Want a few more great Holiday meal ideas? Check out the Make Ahead Holiday Meal Planner! It turned out perfectly browned, juicy, and tender. You could taste the brine, which enhanced the flavor perfectly. We are doing this again!